Ah the transfer window. The time of the year when rumours are flying around left, right and centre with less finishing ability than the balls.ie five-a-side team. Every year various players get linked to clubs, 'BREAKING NEWSTM' is announced, only to be retracted, and yet the world goes on, and other signings are made. There was a time when Nicholas Gaitan was being linked to Manchester United was classed as a done deal, when Robinho was definitely signing for Chelsea that even tricked the Chelsea PR team into advertising his jersey before he signed on the dotted line for the Blues... of Manchester. Which brings us to the latest 'done deal'. 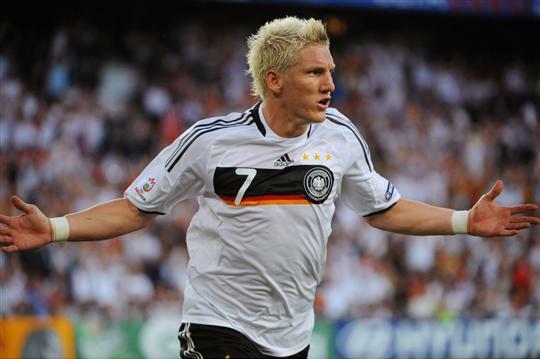 Bastian Schweinsteiger. Reports from Germany last night revealed that the World Cup winner had signed a three year deal with Manchester United. Despite earlier reports saying that he was to have talks with Bayern over his future no earlier than Saturday. It's probably not a stretch so say that United are interested in the midfielder - who wouldn't be? - but reports of a done deal at this stage seem wide of the mark. Especially when the figures being quoted in various reports vary from £14 million to £20 million. Either price would be a steal for a player of Schweinsteiger's quality. What we can take from this is that United are in negotiations with Bayern over a deal; but don't expect anything to be labelled as a 'done deal' until things are actually finalised and announced by one of the two clubs.